HOUSTON  (Nov. 18, 2008)  The Houston housing market continued to feel the effects of the troubled national economy in October and residual business interruptions caused by Hurricane Ike. New monthly data released by the Houston Association of REALTORS® (HAR) reflects improvement from market performance in September, when Ike derailed thousands of real estate transactions. However, the number of property sales across the greater Houston area declined last month when compared to October 2007, with sales of single-family homes down 20.1 percent. The average price of a single-family home dipped 1.6 percent last month to $194,607 from $197,751 in October 2007. That still marks the second highest average price for an October in Houston. At $142,000, the median price of a single-family home in October fell 2.7 percent. Year-to-date home prices are still up compared to 2007 and national figures show Houston continues to fare better than many other U.S. markets, some of which have experienced depreciations of as much as 40 percent. Sales of all property types for October 2008 totaled 4,962, down 21.6 percent compared to October 2007. Total dollar volume for properties sold during the month was $943 million versus $1.2 billion one year earlier, a 22.9 percent decline. The month of October brought Houstons overall housing market disappointing results when comparing all listing categories to October of 2007. Total property sales and total dollar volume fell, as did average and median single-family home sales prices. The number of available properties, or active listings, at the end of October fell 8.2 percent from October 2007 to 49,016. Thats 1,139 fewer active listings than September 2008, and is seen as an indication that inventory levels are balanced and that home prices should remain stable. Month-end pending sales  those listings expected to close within the next 30 days  totaled 3,579, which was 21.5 percent lower than last year and suggests another likely sales decline next month. The months inventory of single-family homes for October came in at 6.3 months, the lowest level since March of this year. That compares to the October 2007 single-family homes inventory of 6.2 months. At $194,607, the average sales price for single-family homes reached the second highest level recorded for an October in Houston, down 1.6 percent from October 2007 when it was $197,751. The overall median price of single-family homes in October was $142,000. That compares to the national single-family median price of $190,600 reported by the National Association of REALTORS®. These data continue to demonstrate the higher value and lower cost of living that prevail in the Houston market. Additionally, total October sales of single-family homes in Houston came in at 4,202, down 20.1 percent from October 2007 and the fourteenth straight monthly drop. HAR also reports existing home statistics for the single-family home segment of the real estate market. In October 2008, existing single-family home sales totaled 3,526, a 17.3 percent decrease from October 2007. At $175,392, the average sales price for existing homes in the Houston area fell 5.3 percent compared to last year. The median sales price of $130,000 for the month was also down 3.7 percent from one year earlier. The average price of a townhouse/condominium increased to $161,428, up 0.7 percent from one year earlier and the highest figure for the month of October. 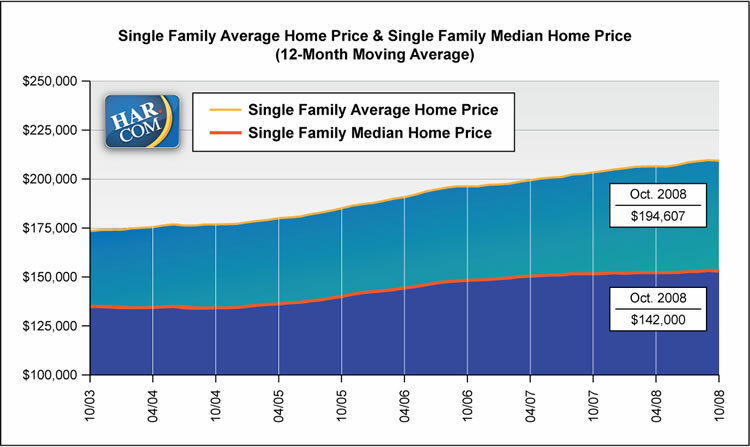 The median price dipped 1.5 percent to $129,000 from October 2007 to 2008. That figure is the second highest historically for the month of October. Demand for single-family and townhouse/condominium rentals increased in October, continuing an upswing triggered by Hurricane Ike, as many sought short-term housing while engaging in storm-related recovery projects. Single-family home rentals rose 36.0 percent in October compared to a year earlier, while year-over-year townhouse/condominium rentals were up 34.1 percent. Lowest months inventory of single-family homes since March 2008 (6.3 months).